This ring is Absolutely Stunning in person; the pictures do it no justice. 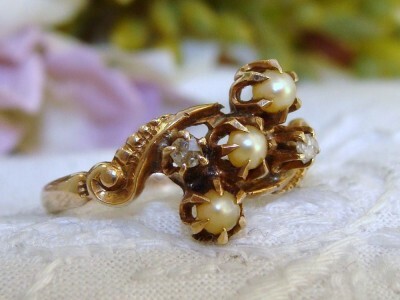 Three warm and creamy genuine pearls and two old cut diamonds are claw-set and arranged in a typically scrolled Victorian setting and of European origin based on the Maltese Cross stamp inside. It looks lovely on with lots of sparkle and the gold has that deep yellow patina which makes Antique jewellery so highly sought after. Excellent Antique condition! It appears it was resized at one time under magnification. There is no evidence of damage or repairs, nor any wear to the settings. It is clear it was worn just a little . It is resizable, if desired – it looks great on the pinky finger.